Anything Gigi can do, Bella Hadid can do better right? 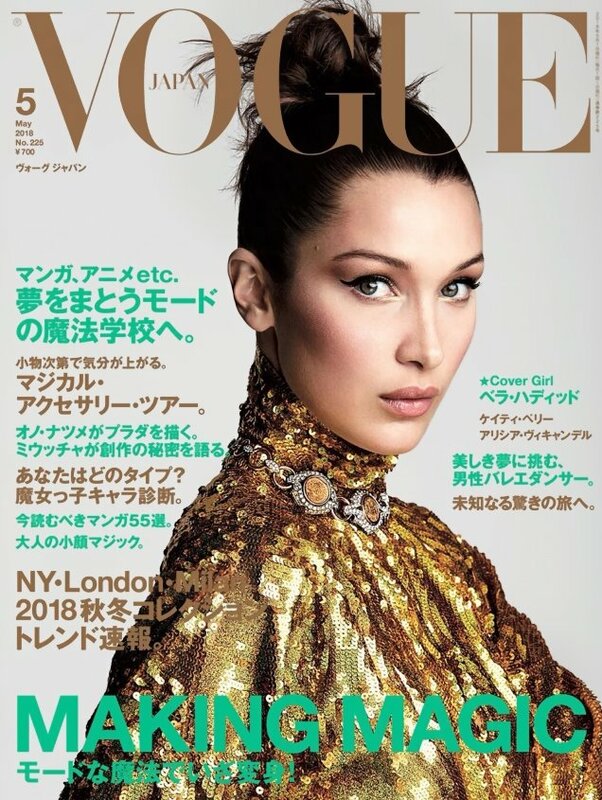 It’s sure starting to look that way as Bella just scored her second cover of Vogue Japan, following in the footsteps of sister Gigi who also has two covers under her belt. Shot by Patrick Demarchelier (eek! ), the current face of Max Mara and DSquared2 and last year’s top cover model fronts Japanese Vogue for May 2018. In the minimalist portrait, Bella gives major side-eye wearing Gucci teamed with Bulgari jewelry (natch), styled by Sissy Vian. Is it time for Bella to take a long vacation? Our forum members sure think so. “And Bella Hadid once again! Tired of seeing her everywhere like it’s never going to end. Well, it’s just another ‘beauty perfect’ picture of her robotic/usual expression face and not interested by that a single bit. NEXT!” declared Valentine27. “I wish it was a full body shot. She is not a beauty girl,” GivenchyHomme chimed in. “Actually rather tame for one of their covers, maybe because Anna [Dello Russo] did not style it? Better than some of their covers, and I agree that the Hadid sisters are just way overexposed, and there seems to be no end of it,” Miss Dalloway added. “It looks like they didn’t even try because this is just boring,” fumed Nomar. But not everyone hated it. “A pretty good cover for Bella. Her face looks relaxed and pretty,” defended Zposen. “It’s a decent cover, I like it,” TeeVanity admitted. Are you here for it? Go check out Bella’s accompanying cover story and join the debate here.